Using the pedal can be a double-edged sword. Sure, it can fill up empty spaces to create seamless playing, but it can also create a yucky blur of sound if you’re not careful. Training your foot to lift and press at the right time is the key to damper pedal happiness. 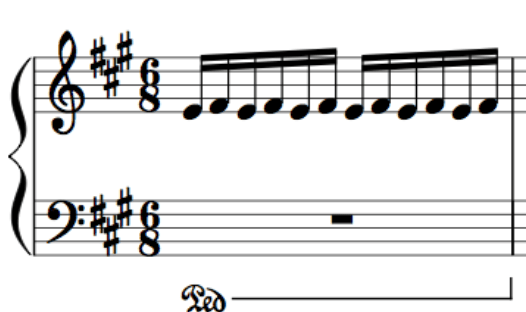 So we’re going to start with a simple exercise to get a sense of this syncopated pedaling technique. All we’re going to do is go back and forth between a C major chord and an A minor chord, deliberately played far apart so there’s no way to make it sound smooth without the pedal. So C-E-G, moving down a couple steps to A-C-E.
Pedaling this is tricky at first, because your hands and foot are essentially going to be doing opposite motions. Press the C chord, and then get your foot down. Keep that foot held down! Don’t lift your foot until the very moment you press the A minor chord. While your hands press the new notes down, your foot lifts, and then presses again, almost like a little flick. You want to go back and forth like this until your foot starts obeying you, and a seamless sound is created. Keep your ears open to make sure you’re not creating any unpleasant sound blurs, or that you’re actually closing the sound gaps! So here are some things that can go wrong. Listen to the sound very carefully. Your foot is going to want to lift at the same time as your hands, so be vigilant and make sure this doesn’t happen. Watch that you’re actually giving a full lift between chords. Another common mistake is having a lazy foot, which doesn’t clear the sound properly. On an opposite note, watch out for mister stompy foot. Keep your heel anchored on the ground, and use the ball of your foot to pedal – you shouldn’t be moving your entire foot up and down. When you’ve got the hang of doing solid chords, try pedaling while playing the same chords broken. It’s the same idea – you lift/press when you change chords, but this is harder because you have less time to think about it. Don’t do this step until you’ve really got the hang of pedaling blocked chords! Pedal markings are sometimes drawn with a line like this, with the lip at the end telling us to lift our foot. You’ll notice many pieces with pedal markings will have this lift occur not between bar lines, but when the harmony (often chords) change. Don’t be frustrated if this is difficult at first! Some people pick up on how to use the damper pedal right away, and others have to spend quite a bit of time concentrating on it before it comes naturally. But try it on a daily basis and I promise it WILL become natural, to the point when you’ll hardly even think about your foot, it’ll just know when to move based on the sounds. If you’d like to try out a piece with syncopated pedal, I recommend checking out Greensleeves – it’s a tune you’ve almost definitely heard, and it’s a good introduction to using syncopated pedal.